A year ago on August 23, 2016 in Santos, Brazil a tsunami was recorded. This was not associated with a storm or earthquake, but was associated with a sunrise in the extreme southeast. The Santos, Brazil tsunami was a wobble slosh, and not associated with the S American Roll. 23 August 2016 on the coast of Brazil was hit by a powerful tsunami. For some unknown reason, the event was ignored by the world media. As if the whole world bent over for a moment, the water rushed towards the slope and then the slope changed in the opposite direction and the water returned to the ocean. The water flooded two city blocks, but did not go further. According to experts, it was not the wind surge, but what was it then? ZetaTalk Interpretation 3/10/2016: This was indeed thus a wobble slosh, in fact occurring when the wobble was returning the globe to its normal position. For sunrise to be too far South in Canada and the UK, the N Pole was pushed away from the Sun for some hours, and this would have caused the S Atlantic ocean to pull away from the shore at Santos and the water to pile up on the coastline of Antarctica. Then the globe bounced back, standing upright again, sliding Santos back under the ocean. Santos thus met the returning water, which had been piled high at Antarctica. Now on August 9, 2017 there is indication that the S American Roll is also responsible for such drama. 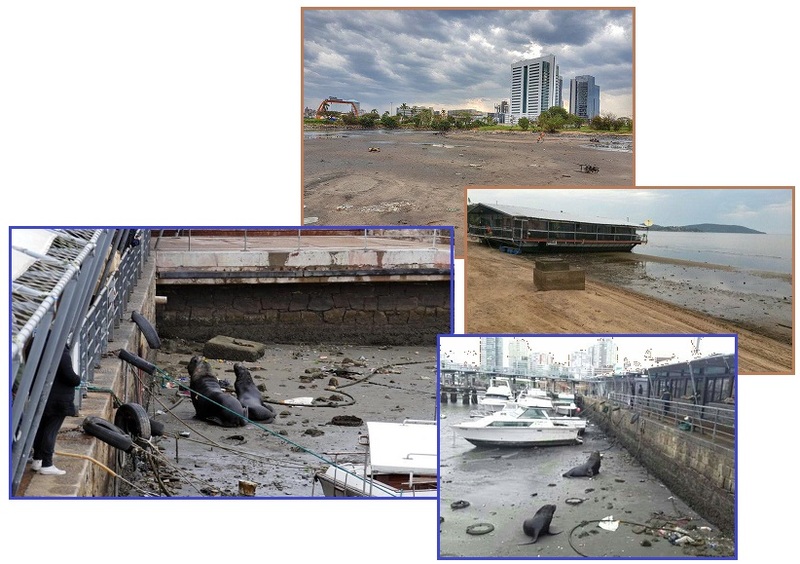 The ocean mysteriously receded from both Brazil and Uruguay. When this occurs accompanied by an earthquake, the quake is followed by a tsunami, but in this case no quake or tsunami occurred. Instead, high waves were recorded along the coast of Chili, on the opposite side of S America. Same time period - high water on one side in Chile and receding water on the other side in Brazil. 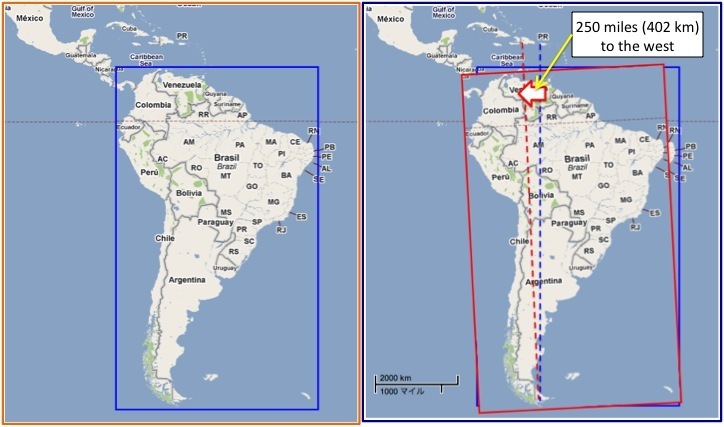 Something really strange is currently happening on the two coasts of South America. It seems that Oceans are in opposition. 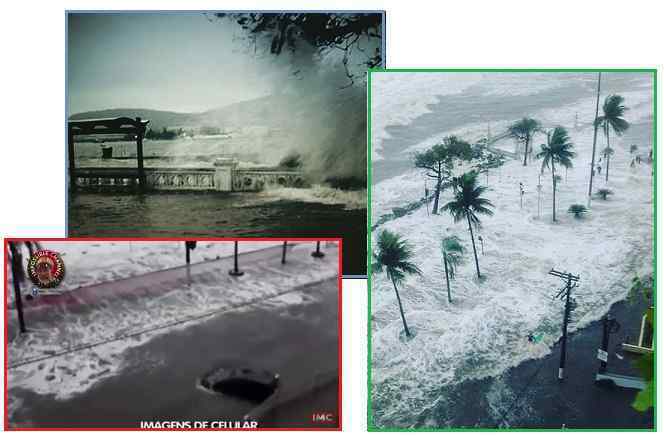 While giant Pacific waves crash on coastal Chile, another historical Atlantic Ocean receding is reported in Caraguatatuba, Brazil. While the Atlantic Ocean recedes dramatically, huge waves have started crashing along the Pacific coast of Chile on August 9, 2017. Are both strange ocean phenomena linked together? Could it be a sign of poleshift? What is the S American Roll? In process as part of the 7 of 10 Plate Movements, the S American Roll pushes the Caribbean Plate down as it rolls the top part of the S American continent to the west. Last covered in Issue 548 on April 2, 2017 when the Nazca Plate to the west of Chile turned red hot from the subduction pressure, the S American Roll has picked up the pace. ZetaTalk Explanation 3/25/2017: Of course this is not an ordinary El Nino, which has its origins from the submarine volcanoes in Indonesia. This warm water off Peru seems to spring to life over the Nazca Plate. The establishment is temporarily surprised and taken off guard as they have no term to explain this, except to admit that the ZetaTalk 7 of 10 plate movements are indeed happening and the S American Roll is pushing the Nazca Plate under the spine of the Andes, thus the heat. The establishment will increasingly be left stumbling for an explanation until Nibiru is admitted. As this happens, water in the Pacific basin is compressed, causing high water along the Andes, and a void would develop along the Atlantic basin, causing the water to recede from beaches there. Water of course rapidly finds its level again, wiping out this evidence, but for a few days, there it was! Proof of the S American Roll. Nibiru has been known to produce major blackouts in the US. In 2003 when it first arrived in the inner Solar System from the direction of Orion, putting on the brakes as it encountered the Sun, the vast tail of Nibiru wafted through the Solar System to assault the Earth. This is of record as New York City went dark, forcing a million commuters to walk home across long bridges in the dark. Per the Zetas, this was a classic EMP, which happened again in 2009 at the Itaipu dam in Brazil. The hydroelectric generators at the dam were not damaged, were rebooted, but the outage affected a massive area. Blackouts in 2003 were extensive. Sep 2, 2003 Finland, Russia, and overnight power blackout in Sydney´s business district. 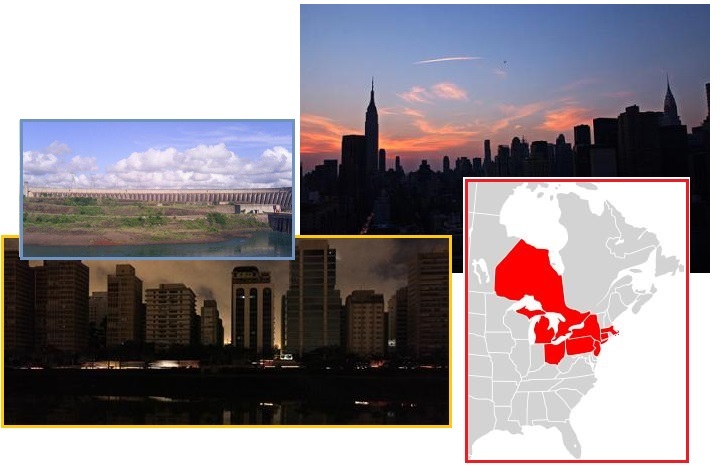 The Northeast blackout of 2003 was a widespread power outage that occurred throughout parts of the Northeastern and Midwestern United States and the Canadian province of Ontario. At the time, it was the world's second most widespread blackout in history. This has been followed periodically with unexplained blackouts - in 2011, from Chile to LA to Pakistan, all accompanied by a fireball blitz. 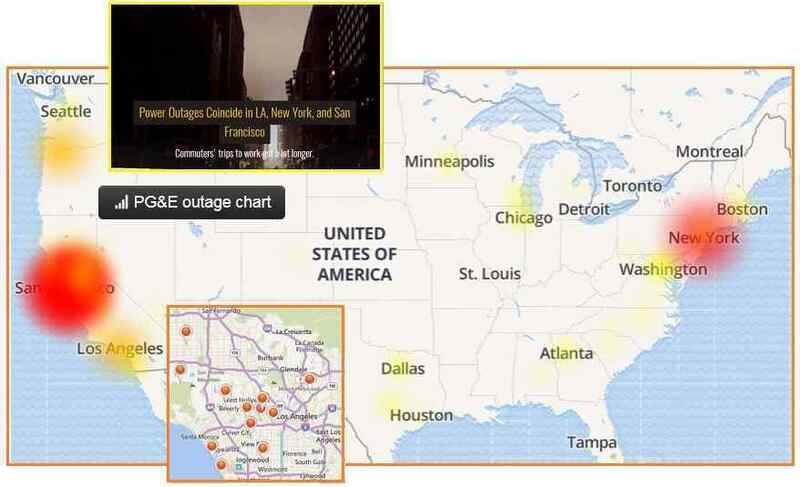 In April, 2017 Coast-to-Coast blackouts occurred in the US - in New York City and San Francisco - pointedly occurring during the same time frame. And in early July, 2017 Central America was hit with unexplained outages. Per the Zetas, this will increase as the time of the Pole Shift approaches. ZetaTalk Prediction 10/6/2007: In 2003, when the tail wafted past the Sun toward Earth, there were all kinds of blackouts, worldwide, caused by this charged tail. The famous NYC blackout in August, 2003, where commuters quietly walked home over the darkened bridges, was one such incident. Worldwide, these blackouts occurred. We warned recently that as the N Pole of Planet X turned away from the Sun, turned outward toward Earth, that these days would return. This will increasingly be the case. But the US government seems determined to prepare. A Black Sky Event is being planned for August 23, 2017 just a couple days after the complete Solar Eclipse visible across the US on August 21. This event is necessary, per the sponsors, for all manner of reasons, but Nibiru is not mentioned as a worry. Nibiru is not mentioned at all. A Black Sky could occur because of a nuclear detonation causing EMP, a Radio Frequency weapon, cyber terrorism, seismic events, CME’s from the Sun, and hurricanes. But not Nibiru. Federal government agencies are preparing for the possibility of “widespread power outages” across the U.S. as a result of a “black sky” event that could “bring society to its knees”. 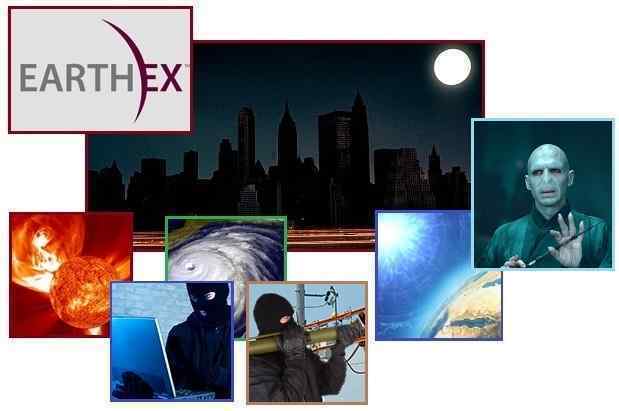 An exercise sponsored by FEMA and the U.S. Department of Energy set to take place on August 23 called EarthEX2017 will wargame responses to catastrophes such as mega earthquakes, cyber terrorism or high altitude electromagnetic pulse attacks. EarthEX simulates a subcontinent-scale, long duration power outage, with cascading failures of all other infrastructures. Participants: Electric Subsector, Oil and Natural Gas Subsector, Water and Wastewater Sector, First Responders, Information Management Sector, Situational Awareness Sector, US and Allied Government Departments and Agencies, Energy, Emergency Management, Critical Infrastructure, Security / Defense, Health, Regulatory. EMP – High Altitude Electromagnetic Pulse: A nuclear detonation in the upper atmosphere creates an electromagnetic pulse (EMP), a powerful, damaging electromagnetic field covering a subcontinent-scale region. Intentional Electromagnetic Interference: When manufactured as weapons, IEMI devices, also known as Radio Frequency (RF) weapons, can in some cases produce multiple, repeated pulses, and are typically quite mobile. Cyber Terrorism: The pervasive and covert nature of this threat has dramatically affected the architecture of security protocols in the United States and allied governments. Seismic Event - High Magnitude Earthquake: In many regions of the United States and other nations, earthquakes risk causing substantial physical disruption, with associated long duration power outages. GMD - Geomagnetic Disturbance (Severe Space Weather): If the highly- energetic, electrically and magnetically charged matter characteristic of these Coronal Mass Ejections (CMEs) encounters the Earth it distorts the Earth’s geomagnetic field, inducing potentially damaging GIC (Geomagnetically Induced Current) in long transmission lines and transformers, the “ligaments” of a national-scale power grid. Hurricanes and Other Severe Weather Events: There is compelling evidence that the increase in severe weather patterns in recent decades signifies a general increasing severity in these hazards, either due to periodic, heuristic factors, or to the climate change effects induced by modern society. ZetaTalk Confirmation 8/31/2017: Every possible hazard except Nibiru is listed as the reason these exercises are necessary. Yet Nibiru is the reason for the rush to prepare. The Sun is nearing the Solar Minimum. Cyber security is not under any additional threats. If the threat of a nuclear explosion above the atmosphere were possible, then why the worry just now? There is in fact nothing new amid man-made or natural disasters to cause the US to leap into these exercises. It is Nibiru. Like Voldemort in the Harry Potter series, “He-Who-Must-Not-Be-Named”, it appears they dare not mutter the name of Nibiru. Nibiru is causing EMP episodes worldwide, from power outages to fires in electrical devices. Nibiru will cause earthquakes that disrupt food distribution and set the oil and gas networks ablaze. Nibiru will cause devastation across continents, across the oceans, so that helping hands from elsewhere are not available. From local governments to the federal level, from country to country, emergency workers will be so focused on the problems at hand they will not be able to spare any assistance to others. To understand what happened on August 12, 2017 in Charlottesville, let’s start with Governor Terry McAuliffe, the current governor of Virginia. His political career is endlessly connected to the Clintons. Prolific fund raiser. Father of the rent-the-Lincoln-bedroom idea that Bill Clinton employed. And after Hillary was let off the hook during her email server investigation, it was revealed that he provided $500,000 to the wife of one of the key FBI investigators, McCabe, who later became the temporary head of the FBI after Comey resigned. McAuliffe represents an unseemly slice of Washington. His primary role in politics for the past two decades or more has been raising money—most notably, for the Clintons. He cooked up the idea of essentially renting out the Lincoln bedroom during the Clinton administration as a fundraising vehicle, and he smashed all previous presidential fundraising records in the process. What’s different about McAuliffe is his brazen mixing of his campaign fundraising activity and attempts to enrich himself personally. Many of McAuliffe’s business deals have come about due to his place in the political cosmos, not because he possesses a wealth of business skill. Virginia governor Terry McAuliffe is a longtime Clinton ally, prolific Democratic fundraiser, and former Clinton Foundation board member, the subject of a federal investigation into his campaign contributions. McAuliffe’s political-action committee donated nearly half-a-million dollars to the 2015 state Senate campaign of Dr. Jill McCabe. She is married to Andrew McCabe, who later became the deputy director of the FBI and helped oversee the agency’s investigation into Hillary Clinton’s private-email server. Then let’s take note that the crowd at the rally was augmented, enhanced. In other words, staged for maximum effect! Though the ad was for nearby Charlotte, NC, it was a short drive to the real theater action in Charlottesville, VA. A Crowds on Demand site working out of Hollywood ran an ad for actors to participate! And what city gives a rally permit to groups like the KKK, Black Lives Matter, NAZIs, and Antifa? The issue was supposed to be protesting the removal of Confederate statues and insignia. Preserving history yes, inciting race riots no! Why was this ‘Crowd Hire’ Company Recruiting $25 an Hour ‘Political Activists’ in Charlotte Last Week? The discovery of a craigslist ad posted last Monday, almost a full week before the Charlottesville protests, is raising new questions over whether paid protesters were sourced by a Los Angeles based “public relations firm specializing in innovative events” to serve as agitators in counterprotests. Are you looking to create a buzz anywhere in the United States? At Crowds on Demand, we provide our clients with protests, rallies, flash-mobs, paparazzi events and other inventive PR stunts. These services are available across the country in every major U.S city, every major U.S metro area and even most smaller cities as well. We provide everything including the people, the materials and even the ideas. You can come to us with a specific plan of action and we can make it happen. Then there is the issue of why, after the motley crew on the Right and the motley crew on the Left were assembled, and promised they would not be tossed together during the protests, the police instead were told to stand down and do nothing while the groups savaged each other. Lights, camera, action! Per the Zetas, this was all to get Trump removed from power, and presumably get the Hillary crowd back in charge. Where are the police?” shouted a man shortly before noon. We still don’t know the answer. Officials refuse to answer. Unite the Right was herded by police into a small area surrounded by Antifa which hurled balloons at them filled with urine, feces, and paint, shouting “Kill Nazis!” Antifa also used pepper spray and Mace on the demonstrators. Police said that they had been ordered by the mayor to do nothing to interfere. Eventually, the National Guard appeared on the scene, and a state of emergency was called. In other words, George Soros and the Deep State have one thing in common. They both want race war. Could all this be political theater to move America deeper into totalitarianism? ZetaTalk Insight 8/31/2017: The Charlottesville rallies were clearly planned, staged, orchestrated, and played out on the hope that Trump would finally get a fatal wound. 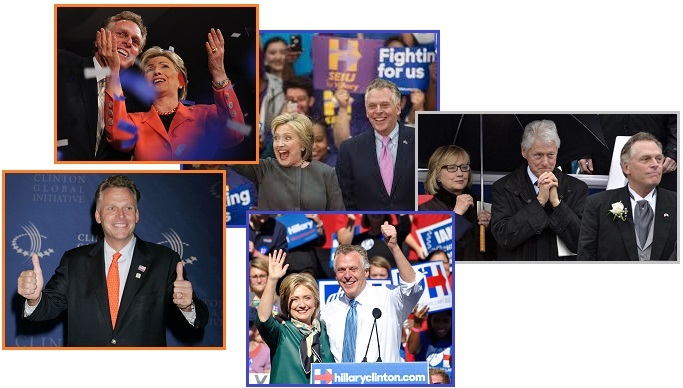 Virginia Governor McAuliffle was a staunch Hillary supporter, on the board of her criminal Clinton Foundation in the past, and like many expected to be rewarded when she gained the White House. This crowd has not lost hope. NAZI and KKK were there by invitation, assured that the police would be ordered to stand down. Antifa and BLM were told the same! McAuliffle all but threw gasoline on the flames, but will face no charges or questions in Virginia. Despite all the hype in the media about Trump and his staff colluding with the Russians, no evidence whatsoever has emerged. Instead, the crimes of Hillary and the DNC’s Debby and DOJ’s Lynch are gradually moving to center stage. What did the Charlottesville handlers hope to achieve? They hoped to start a race war in the US, such that Trump would face impeachment by association. Bannon, still on his staff, was a liability. Trump lingers too long with those who had been loyal to him, but Trump’s Junta will force him to cut ties.